It's a dreary Thursday in Oakland, but I'm cozy in my studio with my morning cup coffee and my Christmas knitting projects. And I witnessed the crime scene seconds after the automatic gunfire stopped. I was quietly knitting the sleeves on a green sweater when the slaying went down. I'm volunteering to work at my local yarn shop while the owner is recovering from surgery. 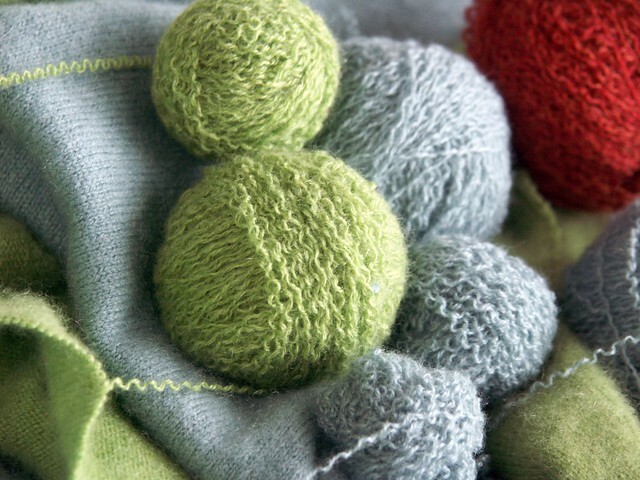 Our knits and purls are like prayers. I pull out yarn. I pull out patterns. I knit swatches and suddenly I have so many projects imagined that I feel all itchy about it. Here are the pair of hand knit socks made especially for Anna at FreePlayCraft, the YOSS giveaway winner. Year Of Stash Socks ~ Giveaway winner announced! I visited family and friends in North Carolina over the holiday, without computer or smart phone. I had a fantastic two weeks, but at the end of my trip I came down with a horrible cold and cough that put me out of commission for a week. I felt too sick to blog, too sick to work, too sick to knit and even too sick to attend my weekly knitting group last night. However I did take some time on my sick-bed to write out all the names for the Year Of Stash Sock Giveaway. After a year of people following and commenting on these posts there are more entries than I expected - almost 400! 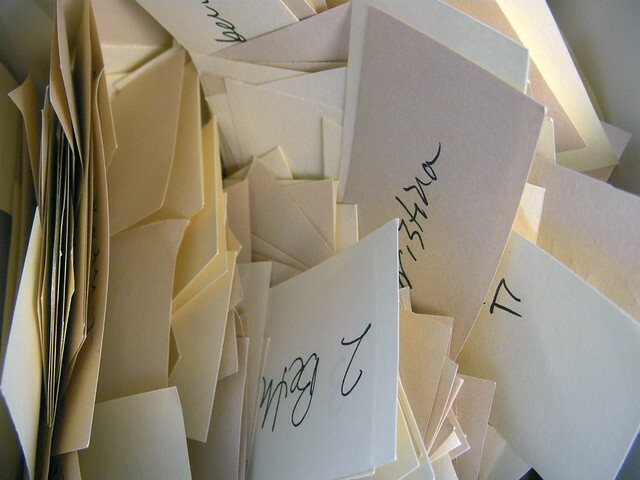 Only two people commented on every single post, Linda & Christina - so they received an extra 24 entries into the drawing. There were three people who only missed one post, so I gave Beth T, Amber, and Anna an extra 12 entries into the drawing. There were plenty of folks who commented on more than half the posts and many who only commented once, but of course it only takes one lucky entry to win. Thanks and good fortune to everyone who entered. 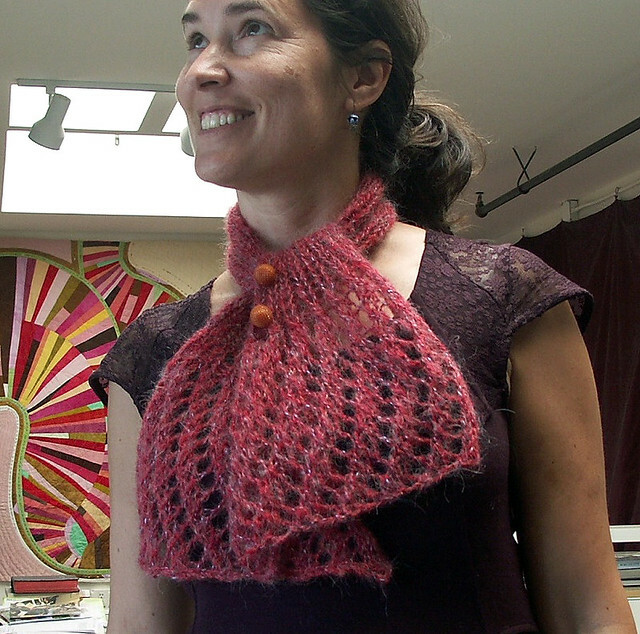 Because I was sick this week, I postponed the live drawing until my Alameda Knitting group meets again next Thursday. Besides the grand prize of a pair of hand knit socks or mitts, there will be two mystery runner-up prizes. I'm working on those this week. I'm feeling better today and am looking forward to a fantastic 2012, with lots of quilting, knitting, fellowship, healthy living, and love! May your 2012 be a year of joy and prosperity! After a week of fun with my sister it's been hard to settle down and get back to work. It's strange being alone again in my apartment. After a day of puttering and straightening the place up I finally sat down to a cup of afternoon tea and picked up some knitting. Inspired by the unique clothes at Anthropologie, I'm creating a pattern for a neck wrap out of a half skein of vintage yarn I found while thrifting with my sister last week. 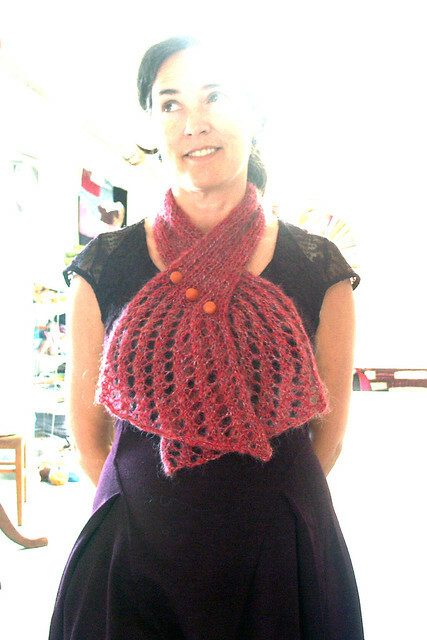 This is my first attempt at making up my own knitting pattern. I'm writing it down and when I get it finished I'll share it with you! I remember the Thursday in early April that I first rode my bike to the Alameda Yarn Shop. I was bored and didn't know anyone in the area, so I looked online for a knitting group. Sure enough one was meeting that very night from 5-9 PM at the local yarn shop in Alameda. I've been a regular ever since. 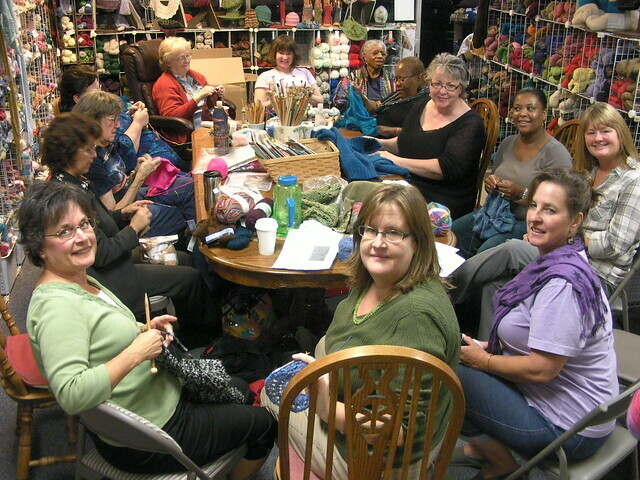 It's hard to describe why it's so much fun to check in with this group of fellow knitters on a weekly basis. It's the punctuation of community I guess. We catch up on the little daily stuff of our lives. We share patterns and techniques, progress on current work, and dreams for future projects. 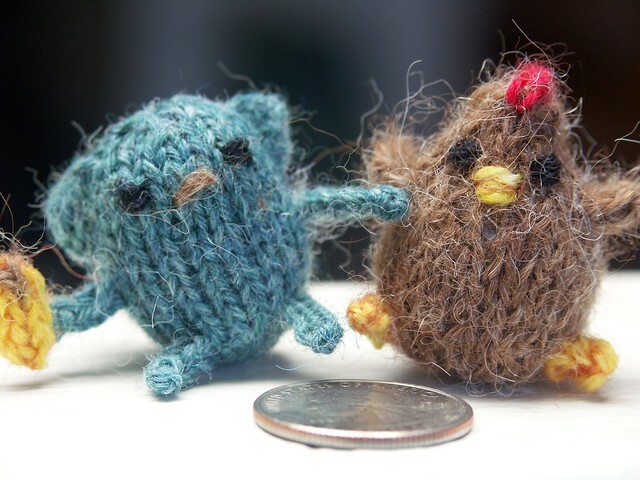 We joke and have fun with each other over things like stash, unfinished projects, and other small faults and foibles. I like this group because of it's diversity. 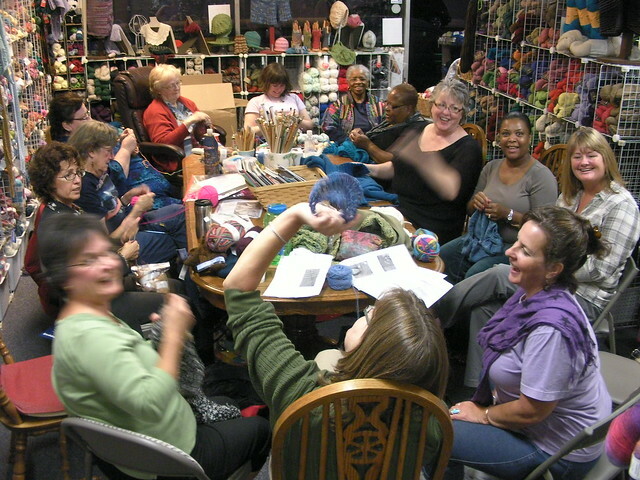 Knitting is what brings us together, but sharing the stories of our lives is what keeps us coming. I like their wisdom and sense of humor especially on subjects of aging, marriage, parenting, and romance. This week I took my biological sister to meet my knitting sisters in crime and she had a fantastic time! and knitted my thirteenth & fourteenth socks of 2011. Share a personal highlight from JULY to enter the Year Of Stash Socks giveaway. You could win a pair of hand-knit socks! 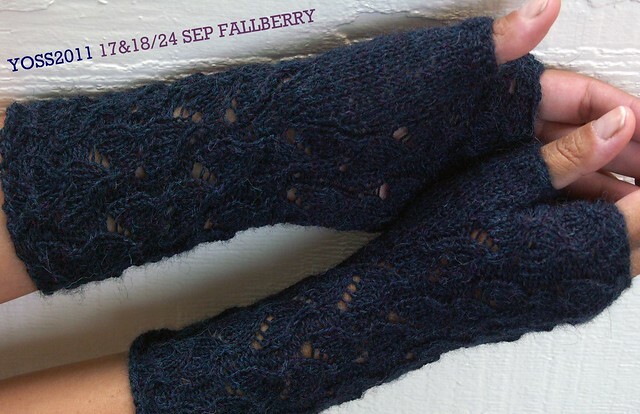 For July I decided to knit the Fallberry Mitts pattern once again but as a sock this time. I used Pattons Stretch Sock Yarn in Sugar. 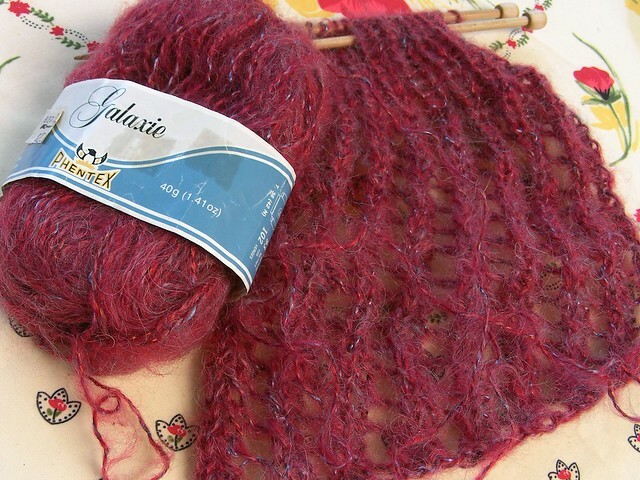 I love the feel of this yarn but the lace knitting pattern was upstaged by the blotchy colorway. Live & learn! From now until the end of the year I will be posting my YOSS socks once a month. If you comment on the monthly posts from June - December each of your comments will count twice towards a chance to win a pair of hand knit socks at the end of the year. If you comment on EVERY YOSS post of 2011 you will be entered into the year-end giveaway 48 times. Subscribe to my YOSS RSS feed to view the complete list of posts. 6.1-6.30.2011 Goodbye party for a friend, traveled to the east coast, hung out with my sister, attended a church reunion at Christmount, taught at Penland! and knitted the eleventh & twelfth (hand) sock of 2011. Share a personal highlight from JUNE to enter the Year Of Stash Socks giveaway. 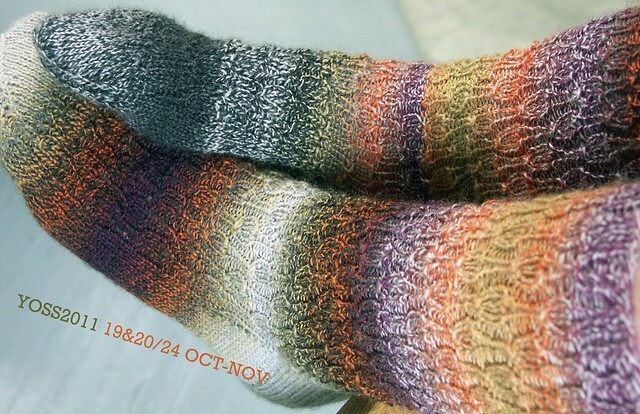 You could win a pair of hand-knit socks! ~ Your entry on this YOSS post counts twice. For June I decided to knit the Fallberry Mitts again as a high school graduation gift for my niece. I used a leftover, bamboo/wool blend, sock yarn. I knit the entire first mitt on the plane flight to the east coast, but I didn't get any more knitting done until my return flight home. So technically I finished these mitts in July!